28" X 10" Cross design knit infinity scarf. 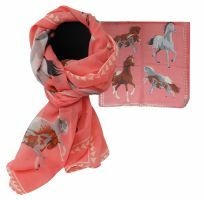 70" X 21" Pink woven scarf with " Wild Mustang" design. 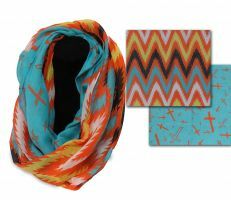 74" X 20" Double Sided Chevron and Cross design woven infinity scarf. 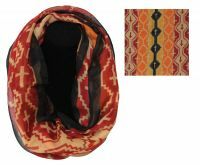 74" X 20" Red/Orange/Yellow/Black woven infinity scarf with cross design. Pink infinity woven scarf with Navajo cross design. 66" x 28". Red infinity woven scarf with Indian Cheif print. 66" x 28". 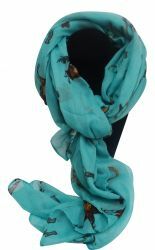 64" X 28" Oversized soft, Turquoise voile scarf with English rider print. 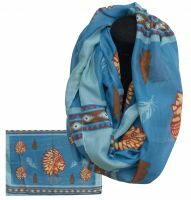 Blue infinity woven scarf with Indian Cheif print. 66" x 28". 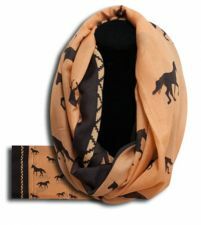 Brown infinity woven scarf with running horses. 62" x 34".